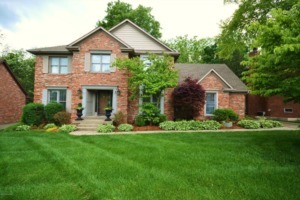 Beautiful 4BR, 2.5 BA Traditional home in Foxgate. Stunning features include hardwood floors, crown molding, Built-ins flank the stone fireplace, and an updated kitchen! The spacious Eat-in kitchen offers an island, stainless steel appliances, and loads of cabinet space. Spacious master with vaulted ceilings and en suite. Fantastic deck overlooking the lush backyard. Click to schedule your showing.